Got brown bananas? Then it’s time to bake this Chocolate Banana Marble Cake. 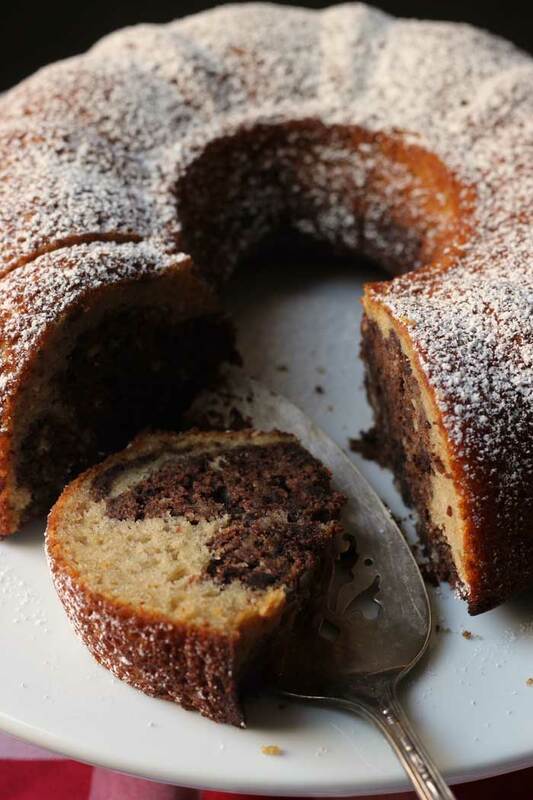 Chocolate and banana are made for one another and they come together so beautiful in this bundt cake. In my effort to use up the hoard of brown bananas under my jurisdiction, I was inspired by this recipe to create one of my own. Stock up on ingredients when they are on sale. The holidays are a great time to stock up on baking ingredients, such as flour, sugar, leavening, and spices. stainless steel mixing bowl – a good set should last you a lifetime. hand mixer – My Hamilton Beach version is going on a decade and still kicking. silicone spatula – I love this two-sided spatula/spoon. It’s great for stirring and scraping. I bought it originally to flip crepes, but I’ve since bought more since it’s so handy. 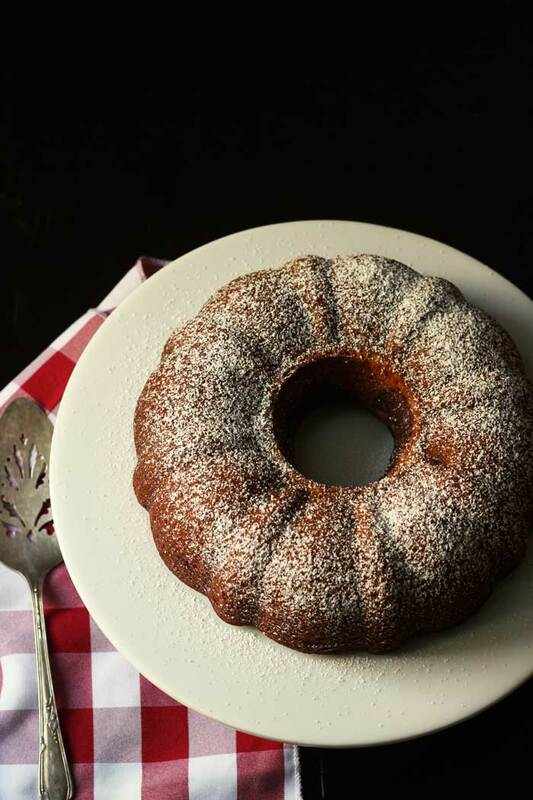 bundt cake pan – Do yourself a favor and make sure you have a nonstick version. cake keeper – Perfect for keeping your cake fresh. Heat oven to 350F. 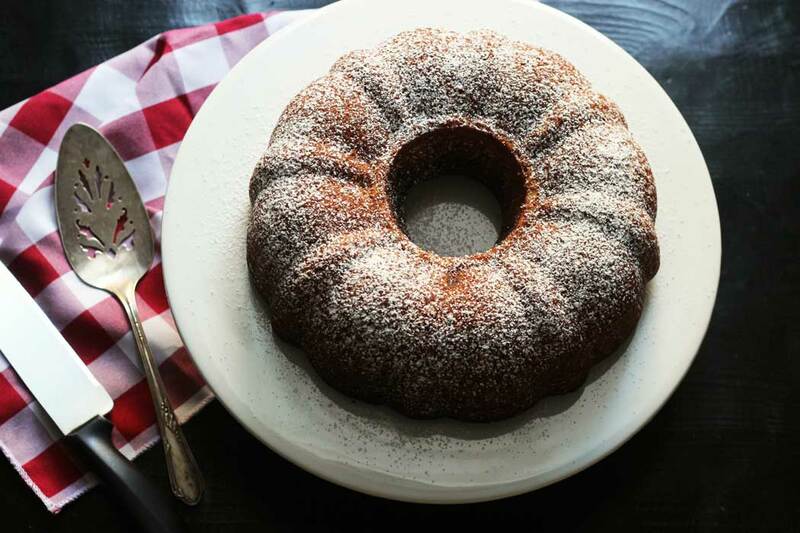 Spray bundt pan with nonstick cooking spray. In mixing bowl whisk together flours, baking powder, baking soda, and salt. In another mixing bowl (I used my Kitchenaid), combine the oil, sugar, and bananas. Beat until smooth. Mix in vanilla, eggs, and yogurt. Blend until smooth. Fold wet ingredients in dry ingredients, combining just until blended. Spoon half the batter into greased bundt pan. Add cocoa to mixing bowl and stir until just combined. Spoon chocolate batter in clumps around bundt pan, leaving some lighter colored spaces. Use a knife to swirl the different colored batters together, taking care not to mix them too much. Bake for 35-40 minutes or until tester comes out with just a few crumbs attached. Cool cake in pan on wire rack for 15 minutes. Carefully, run a rubber spatula around the edges of pan to loosen cake. Invert the pan onto a cooling rack and remove pan. Cool completely. Transfer to serving dish. Sift powdered sugar over top. To freeze: Once the cake has cooled, wrap carefully in plastic wrap and place in a large ziptop bag. Remove as much air from the bag as possible and freeze. To serve, thaw completely. Sift over powdered sugar before serving.